Friend Graham Hill (@grahamhill) took the time to share his thoughts regarding the Morton’s Steakhouse ‘ Surprise Airport Delivery’ last week. I will add my $.02 throughout. There is an interesting true story doing the rounds of customer service blogs at the moment. In it, Peter Shankman a customer service writer, blogger and regular customer at Morton’s Steakhouse jokingly tweeted to Morton’s that he would like a Porterhouse waiting for him upon landing at Newark airport after a long day on the road. Much to his surprise, when he landed that is exactly what was waiting: a uniformed waiter complete with a steak dinner, some side-orders and silver cutlery. Naturally, Peter was delighted and blogged about it immediately. The twitterverse got hold of it and now everybody is talking about Morton’s, about their greatest/worst experiences at Morton’s and more importantly, putting this forward as a great example of customer service. But is it really customer service? Or is it something entirely different? Let’s dissect what happened a little and see. Morton’s is a medium-priced steak restaurant (a three course dinner for two costs $110). Peter is a regular customer at Morton’s. He is also a customer service writer with books about ‘outrageous PR stunts that work’ and social customer service, and he has 110,000 twitter followers. He jokingly said he would like a steak upon landing at Newark but didn’t expect it to be delivered. He was clearly delighted when it was. To delight Peter, once Morton’s had decided to respond, it had to monitor Peter’s flight status, time the cooking of a steak dinner to perfection, get it the 35 miles to Newark airport on time and take a waiter out of restaurant duty to do it. Clearly, the cost to Morton’s of providing this delightful experience would probably take tens, if not hundreds of extra visits by Peter, over and above the ones he would normally make, for them to ever have a hope of recouping the money spent. As Steve Vargo pointed out in a recent exchange about over-delivering to customers, this is a clear case of hugely over delivering against both expectations and desires. Over-delivering against expectations is a good thing as it anchors satisfaction and loyalty, but over-delivering against desires is not. It is costly, economically unsustainable and quickly loses its effect. All in all, as Peter didn’t expect Morton’s to respond at all, let alone to deliver a steak dinner to the airport, I don’t really see this as customer service. So if it wasn’t customer service, what was it? Morton’s clearly scored a coup with their steak stunt. But it only worked because of who Peter is and because of his social influence. Maybe they have been reading Peter’s book and in a delicious (no pun intended) irony decided to respond in this way. Whatever their motivations, even if it was bad customer service, it was brilliant marketing. Hats off to Morton’s for having the guts to try what at the end of the day was a risky PR stunt. It worked spectacularly. Maybe I should read Peter’s book. What do you think? Customer Delight or a Brilliant PR Stunt? Customer service excellence is a core value of many customer service organizations, as it should be for yours. Service excellence is achieved by an almost harmonious dance between the people, processes and technological components. When asked, many simply say: “the team just gets it done”. My question is, ‘how’? My postulate is that this capability can be explained by the proper balance between coordination and collaboration, enabled by a co-operative desire. Processes that are highly responsive to customer needs require complex data, knowledge management, sophisticated rules and cutting edge communication devices. But, in the end, it really comes down to how people (knowledge workers, customers, partners) react and respond to the environment around them. The systems need to work like they do, complexity hidden when possible. I believe that with all of the talk, writing, and proselytizing on collaboration and activity streams the essence of where coordination fits into the customer service realm is being marginalized, or even lost. If a customer calls with a billing question, I should not need to collaborate in order to find the answer; I should just be able to either answer it, or pass it to someone who can, simple. Therefore, I suggest that coordination is of at least equal importance and collaboration is required when coordination will not work. The objective of collaboration is not to collaborate, it needs to be results driven, the problem is collaboration is recursive, thus it takes time. To be clear, I am not suggesting no use for customer collaboration, I am suggesting a time and place for everything. There are instances, such as co-creation where coordination is secondary and that collaboration is critical. I felt it was important to do a bit of research, if only about definitions, to make sure that I personally understood the differences. I am not trying to go down the definition route, but it is not simply semantics either. The diagram above is my visual attempt at segmenting, but also highlighting the overlaps. But it does not tell the whole story, nor might it fit your tastes. Does it?. I simply believe that coordination needs to be considered first, ahead of collaboration, as I believe it to be a peer with collaboration with respect to customer service. Coordination is the organization of the different elements of a complex body or activity so as to enable them to work together effectively (Google definition). I would add that ‘effective’ often translates in business terms to execution and efficient. When a situation occurs, I want my team to be coordinated, roles and responsibilities well defined and each person completely clear with respect to their actions. An interesting extension is that parts of co-operation make there way into the discussion, as often all parties can realize mutual gains, but only by making mutually consistent decisions. A quick summary thus far; Coordination is the ability and capability to work together, where co-operation is the willingness to work together – where does that leave collaboration? Collaboration is working together to achieve a goal. It is a recursive process where two or more people or organizations work together to realize shared goals, (this is more than the intersection of common goals seen in co-operative ventures, but a deep, collective, determination to reach an identical objective) — for example, an intriguing endeavor that is creative in nature — by sharing knowledge, learning and building consensus. (Wikipedia). I believe collaboration and co-operation are closely aligned, with emotional elements highlighting the differences. Many people smarter than I am have put a lot of thought into the goals and objectives of collaboration. It would seem obvious to state that there is a right way to collaborate, and there’s a wrong way to collaborate. If teams lack a strong focus on the results of their efforts, then success will be very hard to measure. The objective of collaborating cannot be to collaborate – and hope is not a strategy. If the barriers to bringing in others to help you solve a problem seem too great, people simply will not stand for it, and will avoid it altogether. It is always important to view the marketplace through the lens of your customers, advocates and partners. A company who truly understands and implements consistent, multi-channel, cross channel customer service experience has figured out how to manage the interdependence between predictable and unpredictable workflows. This is a coordinated approach to customer service excellence. But what is the link? It goes beyond reacting to customer needs, to anticipating customer needs. The path to anticipation involves collaboration (knowledge and intelligence) but the response needs to be coordinated. If a customer contacts you with a serious problem, would you prefer to collaborate with others in the organization to figure out how to fix it, or would you prefer to have a coordinated effort in place, where the work sent work items to the right person to fix the problem? (Remember, collaboration is recursive). Coordination enables the alignment of processes and related information around specific goals and objectives. In the case of customer service, the goals and objectives would be customer satisfaction, often driven by metrics customers care about, like first contact resolution (FCR) and time to resolution. The collaborative element is powered by the willingness of the team, ie co-operation and enablement. A quick note about resolution; customers who have an issue, problem or concern want to be heard and want issues resolved. Collaboration, by definition, will take longer than coordination, thus a coordinated approach is the objective. If this cannot be accomplished, yes, collaborate and figure out the answer! More often than not, the resistance to coordination is that customers seem to be moving faster than an organization can adapt. There is the battle ground between coordination and collaboration; how can I coordination activities if I cannot anticipate and I do not know what is coming next? It is important to note that in order for any of this to work, a common vocabulary needs to be put in place – this includes customers! If everyone is not talking the same language, the customers, no level of coordination or collaboration will be enough to save you! I gave some specifics around the alignment between Service, Sales and Marketing on this topic, at a recent talk in London. An important source for this post was Reorganize for Resilience: Putting Customers at the Center of Your Business, By Ranjay Gulati. (link). My goal was to give context specifically to customer service. Prem Kumar also has a nice post and accompanying slide deck which explores this issue from a different and important perspective. These thoughts are an offshoot of topics I am exploring through a collaborative effort (pun?) with Julie Hunt. 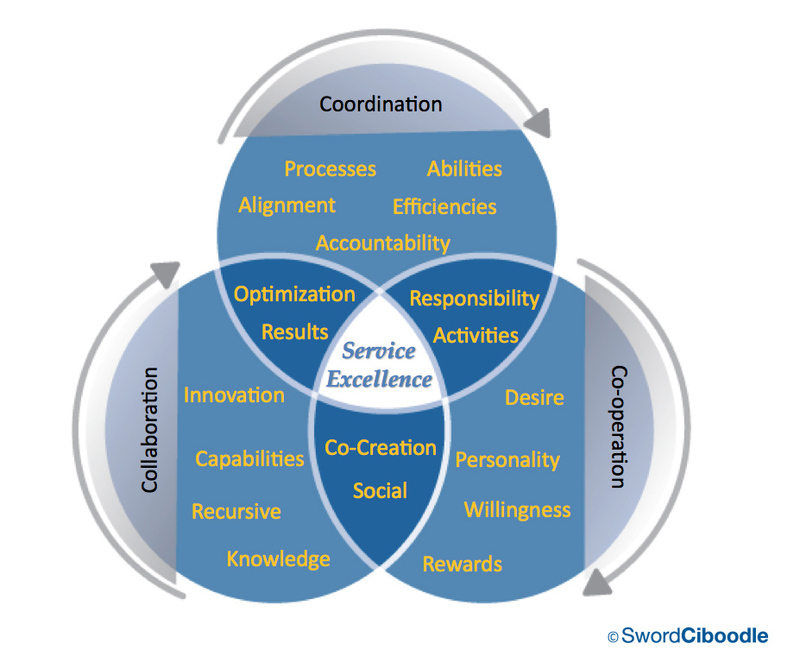 The outcome of that effort is a white paper called “Focusing on the Total Customer Service Experience” – Summary information here; if you would like a copy, no registration forms, just an email to us, whitepaper@sword-ciboodle.com.